Disclaimer number 1 – I have not visited every liquor store in Atlanta and the surrounding neighborhoods. I’ve probably been to at least 60% of them, but there are quite a few I have not made it to yet. This list is based solely on ones that I have been to, but I’m sure there are others out there I haven’t hit yet. This list could easily change tomorrow. Disclaimer number 2 – None of the stores below have paid me a dime. This is purely from my own experience with the store and their selection. Having said that, once this list goes viral, they are welcome to give me discounts or throw dollar bills at me next time I walk in. 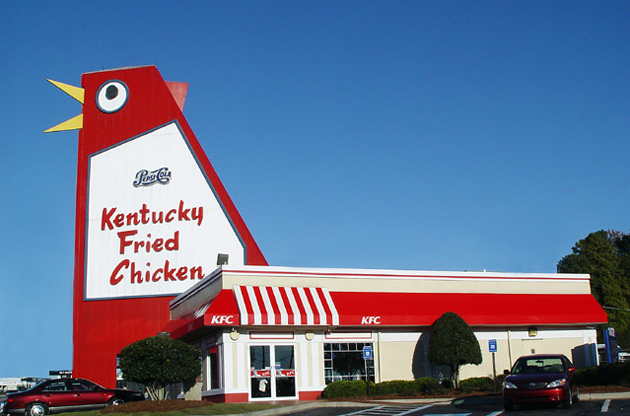 It’s a really big chicken, also known as, “The Big Chicken”. If you ever find yourself up near the Big Chicken, stop over at Big A Package store about 1.5 miles from there. The owner is about the friendliest guy you will ever meet, Nader. He and his brother Ali run the store. Shelf after shelf of bourbon and rye (many of which you have never heard of) line this store. The prices are outstanding, some of the best in the city. Allocated items are a little harder to find, mainly due to the distribution the store is given. But when Nader does get them, he will either set them on the shelf, or announce what he has to his loyal customers and run a random lottery. Last year, cases of Weller 12 made it to this store and sat on shelves, slowly dwindling away for at least 2 months before they were out. Nader, knowing that Weller 12 was very allocated and hard to come by, still left the price at $29.99. He is one of those guys who doesn’t gouge, and for that reason alone, this store is worth a visit. Decatur Package Store – Feast your eyes for a second on this map of Atlanta. 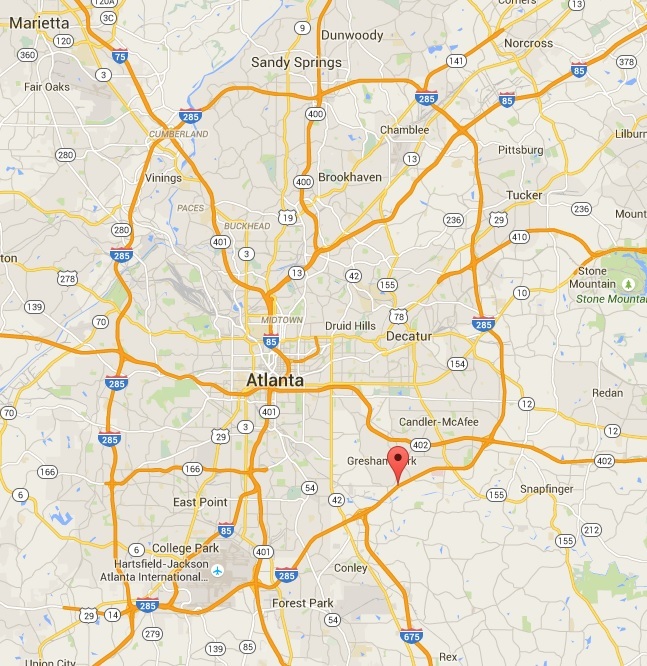 See that almost roundish highway that surrounds Atlanta? That’s I-285, also known as “The Perimeter”. People and places INSIDE the circle are known as ITP (Inside the Perimeter), and people and places OUTSIDE are known as OTP. Decatur is a city close to Downtown and Virginia Highlands, all of which are ITP. It has some great restaurants and bars (visit Mikan if you like Asian food). For the still cool younger folks who live ITP , Decatur is a pretty easy drive. But for whatever reason, for any of us OTP’s up 75 or 400, Decatur is so…damn…far…away. It’s like a 50 minute drive from my house. For that reason alone, I have only been to Decatur Package Store twice. I have to say though, both times I was very impressed with the selection. They have quite a few barrel picks as well, but what impressed me were the bottles I saw behind the counter that I had never seen in stores. On one visit I saw an Abraham Bowman Vanilla Bean Finish and an early batch George T Stagg Jr. On another visit I saw a Willett 8 year rye and something else. Need another reason to visit this store? Every year they sell their BTAC and Pappy to a local bar who runs tastings/dinner pairings from that batch directly for charity. That’s pretty awesome. Green’s – Green’s has two locations, one on Ponce, one on Buford Highway. I have never actually met anyone who has ever gone to the Buford Highway location. That’s not to say it’s not a good store, in fact, typically they both get the same allocations of things. It’s just that the Ponce location is in a very active area and a fun neighborhood (Virginia Highlands), while the one on Buford Highway is isolated on a road adjacent to I-85. Green’s always has a ton of Private Store picks. Last time I was in they had at least 3 different Four Roses barrels, an Eagle Rare barrel, a High West Rendevous Rye barrel, and a few others. They also have a great shelf selection and a decent chance of finding an allocated item on the shelf. I have found IW Harper 15, Buffalo Trace Experimental Collection, Forged Oak, and some other decent allocated items just sitting on shelves. The staff is very friendly, and prices are good. All in all, Green’s is worth a stop if you are passing through Atlanta. And conveniently you pass a Krispy Kreme on the way to Green’s from the highway. Jackie’s – Jackie’s is my secret spot. It’s the place I tell my friends about, but I have a hard time telling strangers about because I want to keep the secret to myself. But if I am making a list of store you must visit, I have to be honest and include this one. So what is it about Jackie’s that makes it worth a visit? Imagine a scenario where you walk into Jackie’s in May and you see on the shelf Elmer T. Lee (and for the standard price of $29.99). You buy one bottle and head home. You realize you were dumb for not getting 1 more bottle since you might not see it again for awhile. You go back to the store hours later and there are no Elmer T. Lee’s left. You ask the owner, a humble but friendly guy named Paul, if there are any Elmer T. Lee’s left. What does Paul do? He goes back into his office, finds the last bottle of Elmer T. Lee from a private barrel they purchased in 2013, and sells it to you at the same price. Yeah, that’s Paul, and that’s his store. A great selection with an awesome staff. He has a few Japanese whiskies on the shelf, and a few private barrel picks. The ones he does pick are outstanding, including his last Four Roses pick. This one is worth a visit if you are spending time north of Atlanta. Sherlocks – In Georgia, a family or an individual may own as many beer and wine shops as they want, but only 2 of those stores may sell liquor. Such is the case with Sherlocks (and Total Wine, and others). There are quite a few Sherlocks locations, but only 2 that sell liquor (both north on I-75). I have to admit, Sherlocks is my honey hole. I am in there on a weekly basis. For starters, they have more private barrels than any other store I have found around Atlanta. At last check Sherlocks had Smooth Ambler Rye, Eagle Rare, Four Roses , Knappogue Castle (Irish Whiskey), Jefferson’s Ocean, Jefferson’s Reserve, Old Forester Single Barrel, and a few other Private picks. Allocated items can be found on the shelves, as well as unusual bottles that I don’t see elsewhere. The staff is fairly friendly, not overly so, but that doesn’t matter with the selection available here. If you are headed up I-75 on vacation passing through Atlanta, make a quick stop at one of the two Sherlocks. I have not gotten to visit World Beverage in Duluth, Camp Creek World of Beverage by the Airport, Capital City Package on Howell Mill Road, or Mac’s Beer and Wine in Midtown, but I have heard good things about all of them. Total Wine? Lots of bourbon and rye, but nothing particularly exciting as well. And damn if the staff really knows NOTHING about bourbon. It’s been months since I asked a question about a product that didn’t require someone to ‘look it up in the computer’. You should definitely check out Capital City Package. Tons of interesting stuff there. Great (if somewhat smallish) wine and beer departments too. Great article! I found it very interesting and useful, Thanks!